The first ever European Poetry Festival will present ten events in three British cities, in under two weeks, from April 5th to April 14th 2018. Over 50 poets from 23 countries will take part, many visiting, many residents of the UK. It will be a pioneering showcase of live literature, including collaboration and performance, and aims at no less than to begin a tradition - an annual festival in the UK, that shares the best of 21st century European and British poetry across the country. It will seize upon a resurgent and vital interest in European culture and tap into a renaissance currently taking place across the continent in avant-garde and literary poetry. The festival is about innovation as well as community, in that the more hospitable the happening, the more challenging the work on display is free to be. With support from over a dozen European and UK institutes, from Arts Council England to Kingston University, and crossing over the London Bookfair, European Poetry Festival will evidence the potential of modern European poetry to be remarkable when witnessed live. The European Poetry Festival finds its origin in The Enemies Project and the European Poetry Night, which is detailed below. The Enemies Project is about collaboration in poetry and literature as a way of building community, and though based in London, this remit is specifically aimed at crossing borders. All the more because the project is based in the UK, it is vital we show our European character, our immense passion for the poets of Europe, as the continent we are part of is going through a remarkable renaissance in avant-garde and innovative poetry. 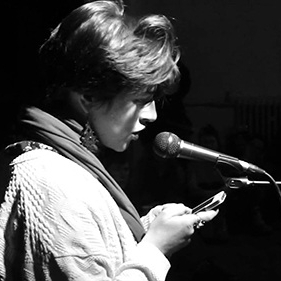 The European Poetry Night is a way to bring together the finest of this generation to London and other cities, to collaborate, to perform, to build connections that will last for decades. Curated by SJ Fowler. Videos below from EPN London 2017, 2016, 2015 and links here to EPN Norwich 2017 and EPN Edinburgh 2015 & 2016. Thanks to the over 100 poets and many dozens of institutions who have supported EPN. A near legendary evening, with over 130 people witnessing 13 new collaborations - brand new innovative performance works of poetry from pairs of poets drawn from over a dozen European nations. The works performed were written for the night, works, in their originality, energy and collaborative quality, firmly against the divisive and counter-intuitive idea of a reduced closeness of spirit across the continent.